The second half of 2018 welcomed a new Darkglass creation, the Hyper Luminal Compressor. It was a particularly special one, as it featured some unique new features: It was, first and foremost, a compressor pedal, but it had a digital sidechain and the ability to digitally model different compressors while keeping an all analog signal path, being the first hybrid design of its kind. It was not a typical stompbox compressor, but actually a high-quality studio compressor with a very transparent sound. Additionally, it had touch sensors that were beautifully designed but also were reliable as a user. “When you do something that’s new, there’s always a risk that people might not accept the cool new features that you worked so hard to conceive and implement”, says our company President, Doug Castro. “The whole process to get the Hyper Luminal out must have taken at least two years”, remembers Tommi Otsavaara, our Chief Technology Officer, as some serious talent was needed to complete the whole product. The effort, according to Doug, definitely paid off at the end, “Right now it’s probably our best-selling product, which is something we are very happy about”. The main objective was to give new possibilities to compressor users. “This is a great solution for musicians that appreciate the subtle and nuanced differences a compressor can have on the signal’s tone and dynamic feel”, Doug explains. “It’s a compressor that adapts to different musicians needs, regardless of the style or even instrument”. “We wanted to create a compressor that is easy to use but also has a lot of parameters under the hood”, Tommi adds, “compressor pedals are often for either guitar or bass, but the Hyper Luminal is different, it’s a universal compressor”. “The hybrid design offers cool possibilities tweaking the parameters such as sidechain high pass filter in the Darkglass Suite, instead of changing components or having trimmer potentiometers inside the pedal” he adds, opening the possibility to use this technology again in future products. 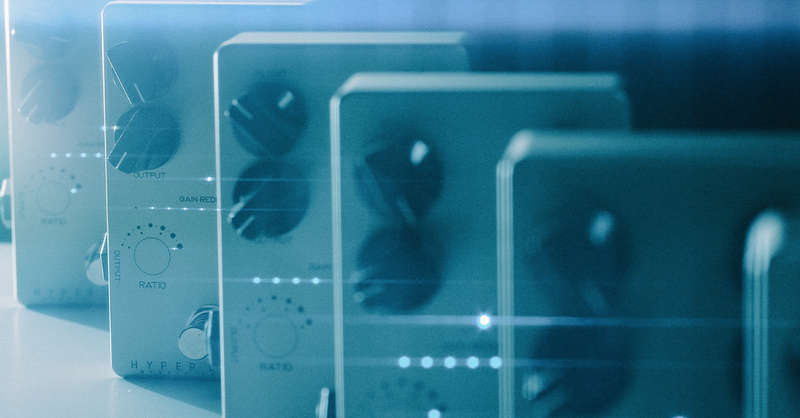 “I hope to see more people adopt it for guitar too or to process a snare drum, or vocals”, he shares, “we are a bass pedal brand, and the Hyper Luminal is a great bass compressor, but it can do so much more too!”. “I think it’s of the utmost importance to be at the top of the game and to come up with new exciting things that haven’t been done before”, Tommi concludes, “these challenges, while causing a lot of headaches sometimes, make our work in R&D interesting”. Doug seconds this opinion, “To have the Hyper Luminal be such a success definitely encourages us to do bigger and bolder engineering projects”.